Therapy is an excellent way to address problem areas in your life or strengthen your coping and wellness. 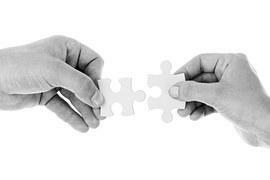 Sometimes therapy may just help put the pieces together, or be necessary to heal from painful experiences. Starting therapy can be a daunting task, but following some of these tips can help navigate the process with more ease. Dr. Harrington works with couples who seek to form a solid foundation for their marital relationship. Major areas covered in counseling include issues such as finances, family background and sexuality, and tools are developed to cope with the common struggles newly married couples face. Dr. Harrington works with couples from primarily an Emotionally-Focused Therapy perspective (see About page for more information). This is the most effective therapy currently with couples and Dr. Harrington finds it to be hugely rewarding for couples whether the issues be minor (communication) or major (unfaithfulness). Helping couples build a strong and secure relationship is a passion of Dr. Harrington’s and she works to engage each partner to form a healthier, more satisfying relationship for both. Please feel free to contact Dr. Harrington with any questions regarding these therapy services. Dr. Harrington offers workshops and seminars to the community on a variety of topics. She has an engaging and lively presentation style, and seeks to provide relevant and sound information for her audiences.